Figure. Slide of a sample of cerebrospinal fluid (CSF) from a 41-year-old woman with headache, fever and nuchal rigidity. She reported that she'd had benign aseptic meningitis 15 years ago and recurrent headaches since 2 years ago, associated with herpetic lesions on her buttocks and lower back. 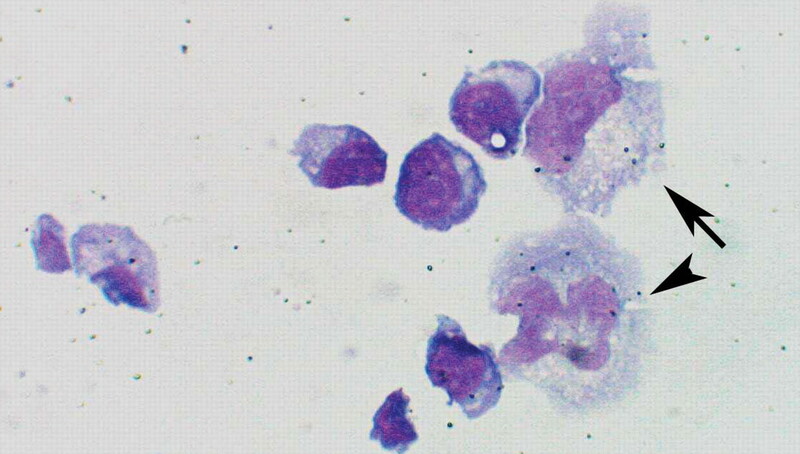 May– Grunwald– Giemsa staining of CSF revealed large monocytes with blunt pseudopods and bean-shaped (arrow, in Fig. 1) and bilobed nuclei (arrowhead). Further examination disclosed 114 leukocytes (all mononuclear cells), 0.75 mg protein, 2.8 μmol glucose and 3.1 μmol lactate per millilitre of CSF. The cells were identified as Mollaret cells. The CSF sample tested positive by polymerase chain reaction for herpes simplex virus type 2. Acyclovir was prescribed for the patient, who recovered completely. Recurrent benign aseptic meningitis was described in 1944 by Pierre Mollaret. Episodes usually resolve without clinical intervention; they persist from a few days to a few weeks, but may recur weekly or monthly for up to 5 years. The virus most commonly isolated is herpes simplex type 2 (Ann Intern Med 1994;121:334-8), but during an episode herpetic lesions may nonetheless be absent. Hypercellularity and prominent pleocytosis is almost always present. The monocytes usually occur singly or in small aggregates and show atypical cell morphology (deeply lobated or cleft nuclei), but the cytomorphology can vary (Diagn Cytopathol 2003;28:227-31). Mollaret cells have also been described in reports of various other diseases, such as West Nile virus infection, sarcoidosis and Behçet's disease. Because it may resolve spontaneously, the role of antiviral therapy in Mollaret's meningitis is often questioned. In selected cases, acyclovir may be useful.